Why are we here? What is the purpose of life? How do we find happiness? Once again, Old Turtle's wise answers offer readers of all ages inspiration, solace, and the most important gift of all -- hope. Timed to commemorate the 25th anniversary of the publication of the national bestseller Old Turtle, this companion picture book is sure to delight fans of the original while it simultaneously speaks to the concerns of the world today. New York Times bestselling author Douglas Wood's tale of wisdom and wonder finds its perfect complement in the ethereal and evocative paintings of Greg Ruth. 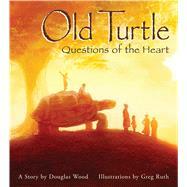 Douglas Wood touched the hearts of readers everywhere with his first book, Old Turtle, the much-loved inspirational classic. He is now the author of more than thirty books, including several New York Times bestsellers. An accomplished songwriter, musician, and wilderness guide, Douglas makes his home in a cabin in the woods in Minnesota. Visit him online at www.douglaswood.com. Greg Ruth has written and drawn stories for Dark Horse Comics, DC/Vertigo Comics, Fantagraphics, and the New York Times. He is also the illustrator of Our Enduring Spirit, a picture book edition of President Barack Obama's first inaugural address, and the creator of the graphic novel The Lost Boy. Greg lives and works in western Massachusetts. Visit his website at www.gregthings.com.